You have a caseload of 300, you’re already getting referrals for small groups, and then your principal asks what your plan for school wide guidance lessons is… Don’t worry you’ve got this! 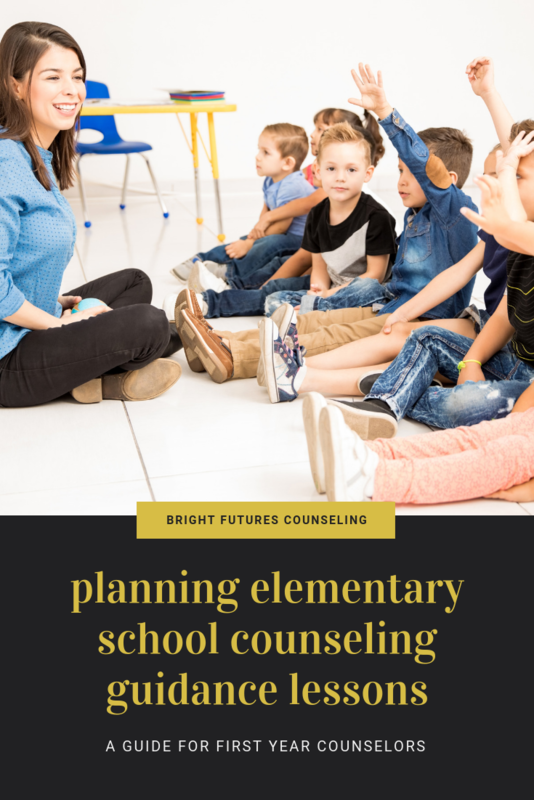 Classroom guidance lessons are a vital and preventative part of your counseling program. This is your opportunity to reach students proactively and equip them with the skills they need so they can manage independently without further intervention. You can look at it two ways. You HAVE to teach every kid in the school or you GET to teach every kid in the school. It’s all about perspective. The more kids you reach with effective tier 1 intervention, the less you will see in tier 2 and tier 3. How Do I Plan my Guidance Lessons? Your school likely has a system in place. Check with your admin to see if there is a curriculum to use. Second Step is a popular option that is commonly used. If you are creating your own lessons, decide what works best for you. Our school was pretty tech savvy and I do not like a lot of print and prep so I created PowerPoint Guidance Lessons with interactive games and videos. They would sometimes have an accompanying worksheet but not often. Some counselors, however, prefer to do crafts or paper workbooks the kids work on each time. Escape room style interactive guidance lessons are a fun option too. Check out mine here. Find what works for you and do it well! If you are choosing to create your own, a good framework to follow is: instruction, video, discussion, activity. You’ll likely only have 20-30 minutes so you’ll want to teach a skill and check for understanding. To make your time go further, create a bulletin board with the month’s character trait or mention it in the morning announcements so students can be reminded of it. This is a passive approach to instruction that is still effective. Feeling a little overwhelmed? Download my 13 guidance lesson bundle here. Bonus Idea: My upper elementary school had 5th grade student ambassadors and they taught the lessons to the 3rd and 4th grade classes. I provided the teacher with a PowerPoint they would go off of and trained the ambassadors, but it was entirely student led! How Often Do I Teach Guidance Lessons? Year two I decided to schedule everything in advance so I sent the teachers one email in the beginning of the year (better than one every month, teachers are some of the busiest people I know!) and asked their ideal time. I then scheduled them out on Google Calendar for the same day and time each month. Naturally, a few times needed to be changed for school holidays, etc but it was a pretty set schedule. The end result: they loved it! They would get notification reminders of when I was coming in and there was way less confusion and frustration on both ends. At my upper elementary school I had several teachers ask for custom lessons to address a problem going on in their classroom. I would create something specifically for their needs. This takes a lot of work, but stay organized and keep everything as you will likely re-use it! My primary school (K-2) had Second Step but my principal asked me to create lessons around the Inch and Miles book. The first year I tried to teach all 15 lessons to every class. The second year we discovered that the character concepts might resonate with the kids more if they didn’t have to remember so many. We then divided them up. Kindergarten would learn 3, 1st grade would learn 5, and 2nd grade would learn 7. This way a student who started in Kindergarten at the school would know all of the character traits by the end of 2nd grade. This was working great, but a few of the Kindergarten teachers said they missed Second Step. I went through all of the Second Step materials and found lessons that matched our 3 Inch and Miles character traits. The result was awesome! It just took some time and tweaking to figure out what worked best for our school’s needs. Bonus Idea: At the end of every month and after every class had received their lesson, I asked teachers to send me names of 3 students they thought demonstrated the month’s character trait. I then made awards and passed them out. We took pictures of all the recipients and applauded loudly. It really made the kids feel special and proud. I also had a drawing where 5 of the award winners could win a prize! It was usually a puzzle or small toy. Guidance Lessons are at the core of your counseling program. This is where you will impact hundreds of lives. Now you’re prepared to rock it! Comment below with some of things you do in guidance lessons. I’d love to know!